DESCRIPTION This supportive sandal can take anything a kid can dish out. An adjustable hook-and-loop strap lets kids put them on themselves, and quick-drying webbing is perfect in and out of the water. TECHNOLOGIES METATOMICAL FOOTBED DESIGN This internal support mechanism is anatomically engineered to provide excellent arch support and cradle the natural contours of the foot. 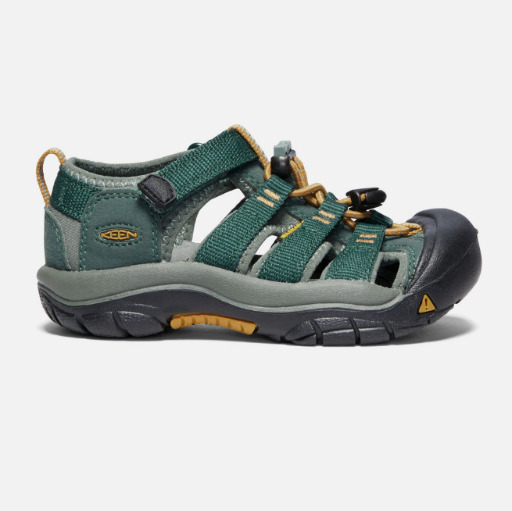 FEATURES Hook and loop strap over instep PFC-Free materials Secure fit lace capture system MATERIAL Washable polyester webbing upper Non-marking rubber outsole Quick-dry lining for active use Metatomical EVA footbed CARE All KEEN water sandals are machine washable. Use a small amount of detergent, wash on gentle cycle and air dry.